Well its about time I get back to blogging.... we are still job hunting... but I need to also stay focused on my blog and Art Fire shop. I used the money I made from my first sale to purchase a few items form other Art Fire shops as a way of seeing things through the buyer's eyes as well as keeping the good fortune going. 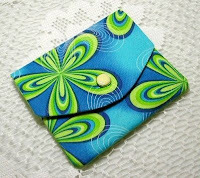 My first purchase was this Mini Wallet from Fabric and Stuff. It is a great little wallet and beautifully made. 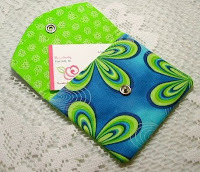 It is 100% handmade and the fabric is vibrant, oh so vibrant! I love this color combination... similar colors can be found in my kitchen! The shipping price was fair, the ship time was fantastic, and it was packaged nicely! The communication before the sale was great too. I liked her items in her shop, but had asked if another color combination was available and she promptly sent pictures of the colors available. Once I chose one, she listed it and reserved it in my name and I was able to buy it. And with Art Fire's new Rapid Cart, you don't need to be a member or sign up for an account. You can just click on the picture of the item you want and pay for it. Fabric and Stuff's Donna Stanley also has a blog and it is worth checking out! She has great pictures of her products and the differnt colors available, from checkbook covers to pin cushions, she has it all. And the colors! Oh I could just go on and on! I have a thing for fabric, especially the bright, cheerful ones and I bet she does too! Other tidbits and gems can be found on her blog as well. Please take a look!